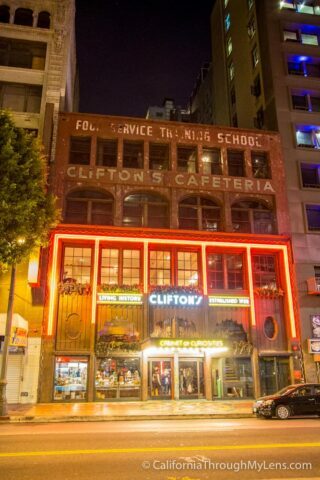 Clifton’s Cafeteria is a historic eatery on Grand Ave that has been a staple of Los Angeles for almost a century. It was closed for while but it just reopened its doors a few months ago to usher in the love and devotion of another generation of families. I got a chance to check it out for the first time a few weeks ago, and here is all the information. 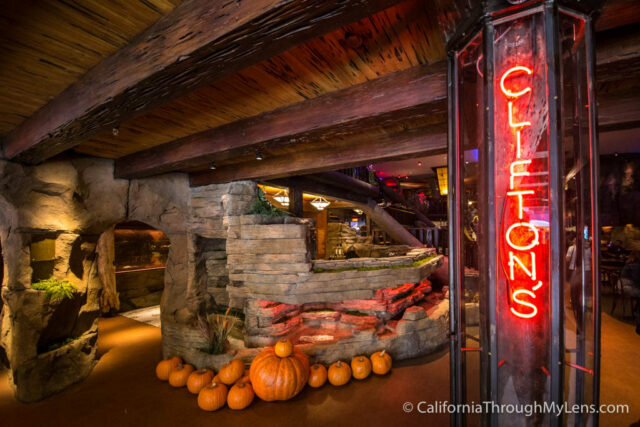 Clifton’s opened in 1935 and has been operational at the same location on and off for the last 74 years. 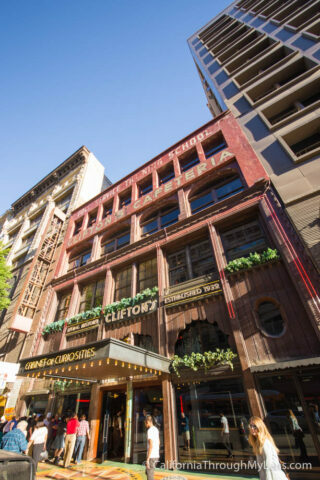 The cafeteria became famous because of the owners Christian faith where it is said that he never turned anyone away hungry even if they could not pay. The original owners sold it in 1946 then it was sold again in 2010 when it went through a 5 year renovation only be opened again in October 2015. After parking in one of the structures near downtown you will proceed via foot to the restaurant itself. There is some street parking but it is pretty sparse. When I went at around 1PM on a Sunday it was a 45 minute wait to get in and get food. This place has been incredibly popular since it reopened with new visitors coming for the first time and older visitors coming for nostalgia. I was already committed to going so I hopped in line to wait. After about 20 minutes of waiting I made it to the inside line and after about 20 minutes in this line I was finally at a place where I could start looking at the food. It should be noted that there are a bunch of different things to look at while you wait, such as an area with candy and toys, and a stuffed fox exhibit. 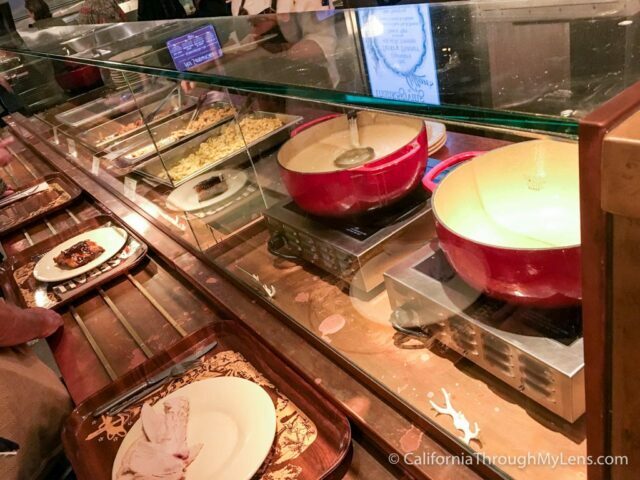 The food itself is exactly like you remember a cafeteria being. You simply take your tray around and look at the different options then you pay by what you take. I ended up getting the $12.99 special which was a protein and two sides. I went with turkey, macaroni and cheese and vegetables. I also grabbed a butterscotch pudding in a chocolate cup you can eat and a soda. My total came to around $20 for all of this, which I thought was pretty expensive for what I got. 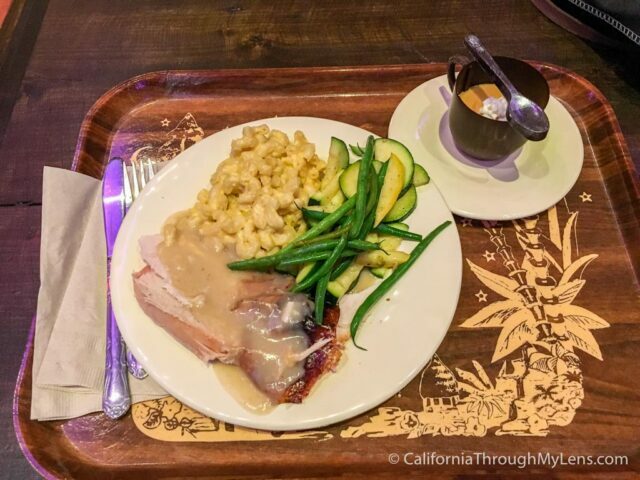 The food was exactly as you would anticipate cafeteria food to be. It wasn’t bad but it wasn’t great either. 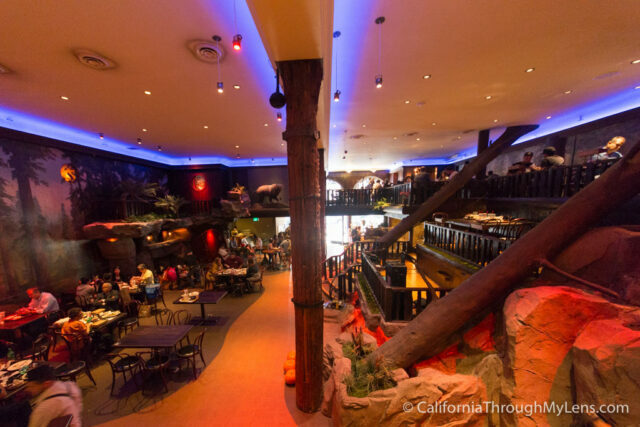 The highlight of this spot really is the atmosphere you get to eat in. Like I said above, the atmosphere at Clinton’s is the main draw. 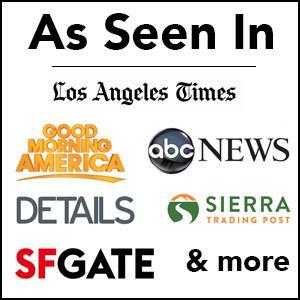 It is a complete sensory overload and will have your kids talking about it for weeks after. 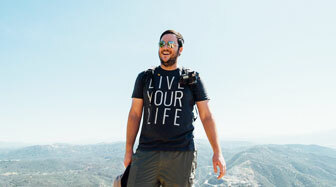 Here are just a few of the things you will see when you are there. This was my favorite spot in the entire restaurant. 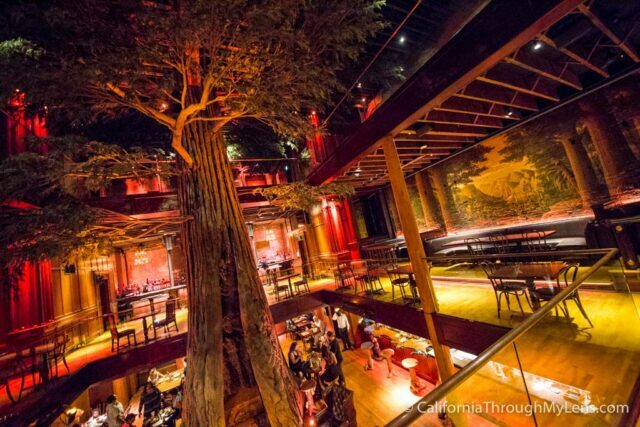 When you go up the steps to the second story you will see a massive indoor redwood tree that you can sit and eat at the base of. The tree goes up at least a few stories and it is worth heading up to see it from the third story as well. 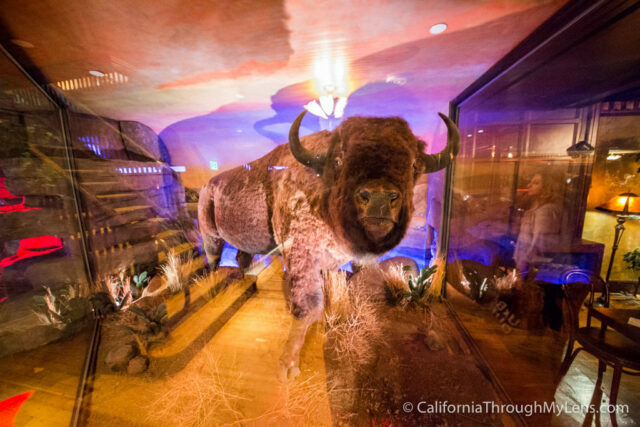 Also on the second story is a full replica of a buffalo behind glass. I was shocked to see this massive creature here and it was a big draw with lots of people taking pictures. 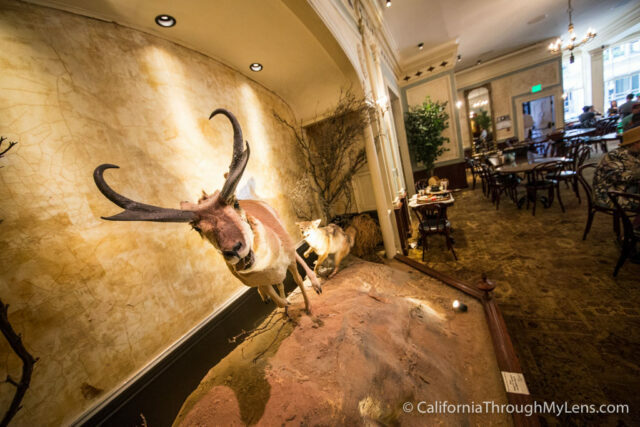 Not to be outdone by the buffalo, the third story has a few more taxidermist animals like a mountain lion and a coyote chasing an antelope. 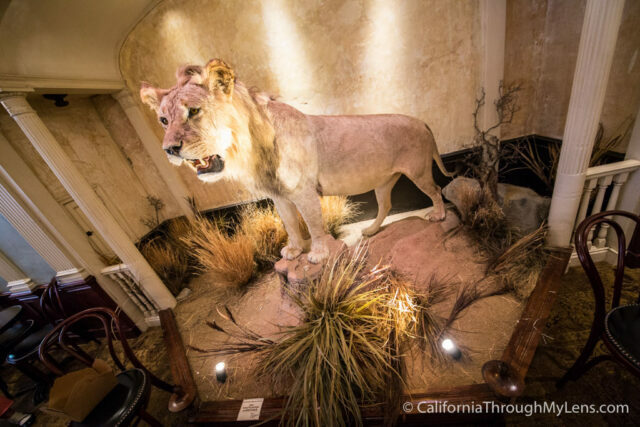 These attractions have tables right next them, so you can sit below the mountain lion and eat your meal. 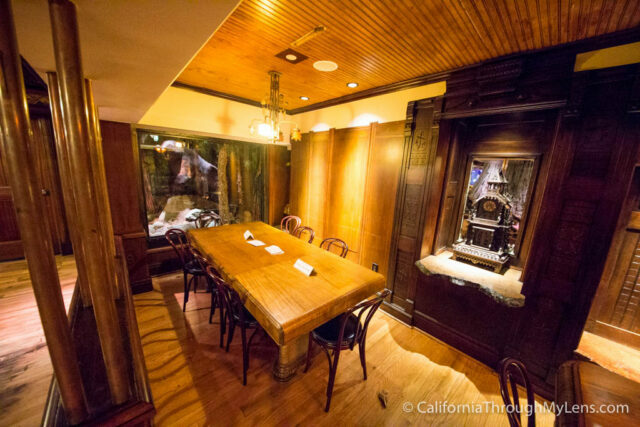 You can call and set up a private dinning area for a large party and the area they put you in is right next to a stuffed bear that watches you while you eat. If you bring your kids here there is a small box in the cafeteria section that has a collection of small toys for children to grab one and play with. A fun addition to a crazy spot. There was also a band here when I went and even though it was incredibly busy, there was so much space that it never felt too crowded. All in all this is one of the places that you go to for the experience more than the food. 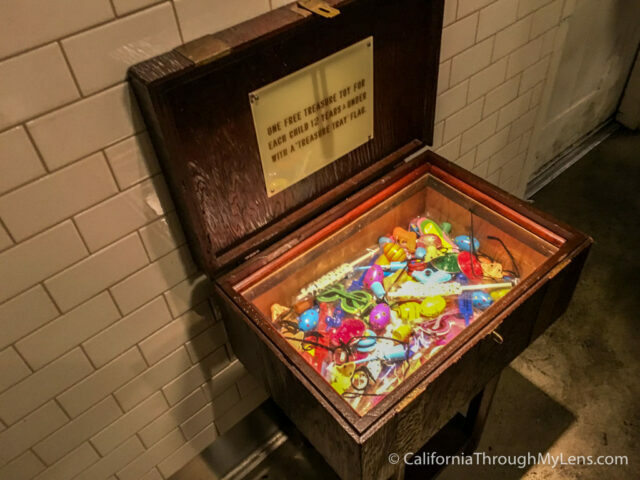 It is a really fun spot that I recommend you bring the family to for a fun adventure, just don’t expect to be raving about what you ate as much as you will be raving about what you saw. 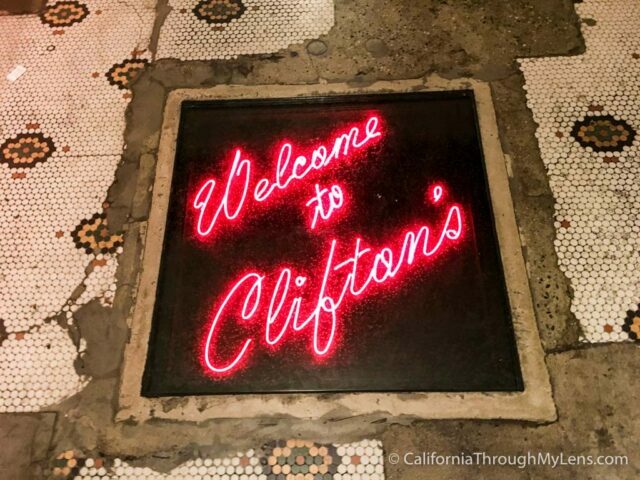 Let me know what you think about Clifton’s in the comments below.